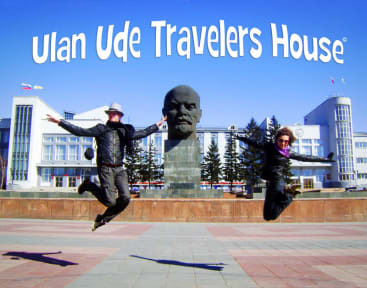 We are the only english-speaking hostel located in the heart of the city at the Lenin's head square. Perfect location gives you just a stone's throw from the transsib train station and less than a minute to the main sights of the city. From our window you can see a tip of the Lenin's head's nose. Join our cooking evenings, we cook for you 3 days a week. Roomy, cozy flat with a guest kitchen, spacey common room and a hot shower will serve you as the best base for your exploring. The hostel has 2 rooms for guests, each has 8 dorms (4 double bank beds) all equipped with comfy mattresses, blankets, pillows and bed linen. And 1 big common area room for talking, having fun, playing games etc. We also arrange bus tickets to Mongolia (11 hour drive), arrange TOURS to lake Baikal and Ulan-Ude (OldBelievers, Buryat village, etc), arrange train tickets through Russia, help you get a mongolian visa and much more. 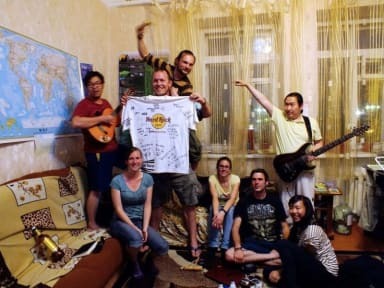 Denis, the owner, has traveled a lot through TransSib, so he'll be happy to share the experience and to give useful tips. Great place, no complaints whatsoever. You can’t get more central, the atmosphere was clean and bright, and all staff were friendly and helpful. I recommend both the city and the hostel very much! Great location, helpful staff and clean. Directions need a bit more detail, especially if you’re arriving early in the morning as I did. The yellow building as the sign “67000” above and you need to find the right hand corner of the ‘square’ the building forms with the other L shapes building on its right. Look for the black door with “Traveller’s House” on it. Wasn’t easy looking for it at 5.30 AM :) Apart from that, was a great stay! Nice staff but a ‘real’ hostel: it is more a large appartment converted into an hostel. It’s definitely the perfect hostel to stay in UU! This hostel feels more like couchsurfing than paid accommodation. In a good and a bad way. Cozy, friendly, but a bit unprofessional. Excellent location (if you find the entrance door first). Staff agreed to book an additional night stay for us only to tell us on the day that we couldn’t stay any longer and needed to leave. Disappointing. Found a good alternative pretty quick, Husky Hostel is recommended.